Archaeology has provided precious little evidence for the biblical account of a powerful Judaic kingdom 3,000 years ago, but the sheer extent of copper mining in Timna, when Egypt was in a state of collapse, is otherwise hard to explain. In the 10th century B.C.E., the Israelite tribes were led by judges, but cried out against them, and yearned for a leader. Samuel warned them of the follies of kings: “And ye shall cry out in that day because of your king which ye shall have chosen you“. Yet Saul was elected anyway, and would be followed by King David and his wise son Solomon. These kings created a powerful United Monarchy stretching from the Mediterranean Sea to the Jordan River. So goes the biblical story (Samuel 8:1-14). Yet no archaeological evidence has been found that even remotely supports the grandeur described in the biblical accounts of David and Solomon, who ostensibly reigned between 1050 B.C.E. and 930 B.C.E. The only material sign of the kings’ existence is controversial too: a stele found in northern Israel, from the mid-9th century B.C.E., inscribed with the words “House of David.” But not everyone agrees that’s what the stone even says. According to the bible, after David assumed the throne and conquered Jerusalem from the Jebusites, he consolidated the kingdom, including by conquering Edom. David’s son Solomon took it further, building up Jerusalem and the Temple and entering into political alliances. After Solomon died, in around 930 B.C.E., his son Rehoboam was unable to hold the kingdom together: it split into Israelite and Judahite entities fighting each other. Is that what happened? Did a great United Monarchy take form, chiefly under David, develop further under his son, and then fall apart? There are archaeological remains from the 10th century B.C.E., but they have settled nothing. “Maximalists” comb the remains for support for the biblical narrative. “Minimalists” argue that the ruins have not been proved to be related to an Israelite kingdom, let alone one run by David or Solomon. Take the stone palace found in Jerusalem. Maximalists say it dates to the appropriate time and obviously belonged to David. Minimalists say its period hasn’t been proven, let alone its provenance (more on this below). The biblical narrative may have gone overboard on extolling the virtues of the two kings, but a preponderance of evidence indicates that some kind of powerful polity did rule from Jerusalem. One of the best arguments is the massive copper production during the 10th century B.C.E., at Timna, three hundred kilometers south of Jerusalem. 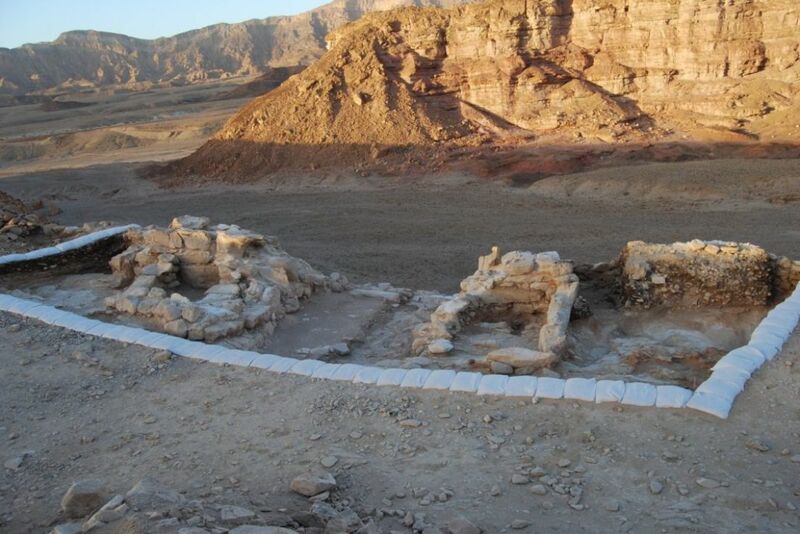 There, in the dry desert, Dr. Erez Ben-Yosef of Tel Aviv University has spent 14 years excavating copper mining and smelting sites of Jordan and Israel, dating to the 10th century B.C.E. The mines in the Aravah valley are in the very territory the Bible says David won from the Edomites, who then became subject to Israel (2 Samuel 8:13-14). The copper industry in the region – at Timna and Khirbat en-Nahdas in southern Israel, and at Faynan in Jordan – was clearly vast. More than 100,000 tons of slag from the Iron Age have been discovered in the area. Until the collapse of Mediterranean civilizations in 1200 B.C.E., Cyprus had been the main regional source of copper. After the collapse, the mines in the Aravah valley came to the fore, Ben-Yosef and Prof. Israel Finkelstein of Tel Aviv University told Haaretz. The sheer scale of copper production at Timna and Faynan would have required the support of a major polity, scholars studying the Aravah agree. For one thing, the mines needed external assistance. Separating copper from ore required maintaining charcoal fires at about 1,200°C for eight to 10 hours (using blowpipes and foot bellows). No food was available in the barren reaches of the desert where the mines were: there had to be a procurement and import system, also for wood to make the charcoal. Supplies would have traveled as much as hundreds of kilometers. Water was a bit closer, but: “There is no water near the mines. It had to been brought in from the Yotvata oasis 15 kilometers away,” Ben-Yosef says. Supporting Timna’s massive mining operations, therefore, required long-distance trade, or in other words, complex economic activity involving a bureaucratic apparatus. Archaeologists have indeed found evidence of imports from afar (and cloth) dating to the time of David and Solomon. Next to 5-meter high fortification walls, the archaeologists found slingstones, a variety of seeds, fish bones, and donkey bones and dung preserved well enough to be analyzed: it shows the draught animals at Timna ate hay and pomace, the pulp from pressing grapes, olives and suchlike, imported from the Mediterranean coast, more than 200 km afar. The fruits, cereals, fish and textiles were probably imported from Philistia and Judah. 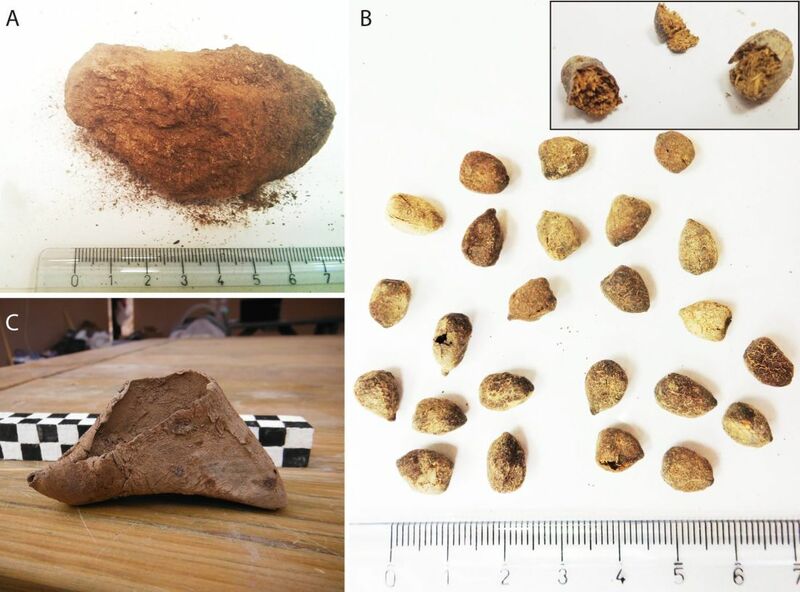 More than 200 samples found at Faynan, Timna and Khirbat en-Nahas have been dated by radiocarbon analysis, to the 10th and 9th century B.C.E. United-Monarchy skeptics such as Finkelstein do stress that the existence of the vast mining operation does not necessarily mean there was a powerful United Monarchy. There could be other explanations, including the original assumption, which is that the Aravah mines had been controlled by Egypt. No question, the Egyptians had indeed been at Timna in some fashion or other before the postulated United Kingdom era, around the 12th-13th century B.C.E. We know this from Egyptian artifacts, hieroglyphics, and a temple dedicated to the goddess Hathor found at the site. Irrespective of who controlled them, Prof. Philip R. Davies of the University of Sheffield speculates that the copper mines were particularly active in the 10th century B.C.E. because of heavy demand for copper in Egypt, especially when the supply from Cyprus collapsed. Indeed, everyone agrees that the actual 10th-century B.C.E. miners were the Edomites. The question is who was in control. “My preferred candidate is Egypt. Edom does not seem to have been politically developed to the extent of organizing all this,” Davies elaborates. However, this period is marked by the fall of the Hittite Empire in Anatolia, the collapse of the Mycenaean civilization in Greece and, further down the line, Egypt, Babylonia and Assyria also sank into a down-spiral. Not one single shard of Egyptian pottery has been found associated with the 10th century B.C.E. copper operations. Moreover, in the early 10th century, the great Egyptian civilization was in decline, together with most of the rest of the Levantine empires, creating a power vacuum and enabling the advent of the new polity – the Philistines. “After the decline of the Egyptian empire in the Levant, around 1130 B.C.E., Egyptian interventions in Syro-Palestine diminished significantly,” Egyptologist Shirley Ben Dor Evian, curator of Egyptian Archaeology at the Israel Museum, Jerusalem and researcher at Tel Aviv University told Haaretz. Finkelstein doesn’t necessarily agree with Davies that the Edomites were inadequate to controlling the mines, though the Edomites were desert nomads, like the Bedouins today. Finkelstein feels the mines may have empowered the Edomites, and that outside control, whether from Jerusalem or Egypt, was not necessary. “The mines were operated mainly by locals and the prosperity there brought about the rise of a desert [Edomite] polity,” Finkelstein suggests. The notion that local pastoral nomads procured resources via a complex system of trade networks and then decided to live in stone fortress (buildings), instead of tents, is supported by Finkelstein’s colleague Nadav Naaman, Jewish History professor at Tel Aviv University. “It is reasonable to assume that there was an Edomite polity in the south in the 10th century B.C.E. that operated the mines in Timna and in Faynan,” Na’aman says, adding, “I doubt whether David or Solomon were involved with the copper production in the Aravah.” Or maybe they were. The bible doesn’t mention mines and Solomon in the same breath, but Solomon is said to have used a vast quantity of copper in furnishing the temple in Jerusalem. That lends credence to the theory that he would have sought control over the Aravah copper mines. At the entrance to the temple stood two colossal, hollow copper pillars eight meters tall, 1.7 meters in diameter and topped with 2.2-meter capitals (1 Kings 7:15-16.) The copper “molten sea,” a huge basin used by the priests for washing, had a capacity of 66,000 liters (1 Kings 7:23-26, 44-46). That’s 66 tons in displacement volume. Some experts feel the sheer elaboration lends verisimilitude to the biblical description. Nadav Naaman assumes that the grand descriptions of the 10th century B.C.E. temple were written centuries later, but he does think that Solomon did build the First Temple in Jerusalem. Once upon a time, city folk knew who erected major buildings, Naaman points out. “Local traditions may persist for centuries. I assume there was a local memory that it was Solomon who built the Jerusalem Temple on the Temple Mount,” he says. According to the bible, David conquered Edom but it was Solomon who consolidated the Judahic empire, including through trade. Put otherwise, if there was a United Monarchy, it would have traded, as big states do. The bible has ample descriptions of trade at the time, not least in metals; it also describes the Phoenicians coming to Jerusalem to build, and Solomon’s joint business venture with King Hiram of Tyre. Hiram sent cedar timber from of Lebanon, as well as wood and stone craftsmen (2 Samuel 5:11; 1 Chronicles 14:1) to build the “House of Cedars” and the First Temple. In return Solomon sent wheat, barley, olive oil and wine (1 Kings 5:2-6; 2 Chronicles 2:3-10). There is also a richness of evidence that the peoples around the Mediterranean were briskly trading for centuries and possibly millennia before. It isn’t impossible that the vaunted “United Kingdom” might have been just a sort of trading hub, as Mycenaean Greece served as a focus for trade reaching much of the Levant. Never mind that archaeologists often disagree on who traded with whom, let alone who built what. This biblical passage describing how David wrested the stronghold of Mount Zion from the Jebusites and made it his capital, and then built a new palace with the help of the Phoenician king, Hiram of Tyre (2 Samuel 5:17) gained new life in 2005, when Prof. Eilat Mazar from the Hebrew University, announced that she had found the ruins of David’s Palace. Not all agree that the structures she found was a palace, let alone one built by David. At the very least, its dating is controversial. 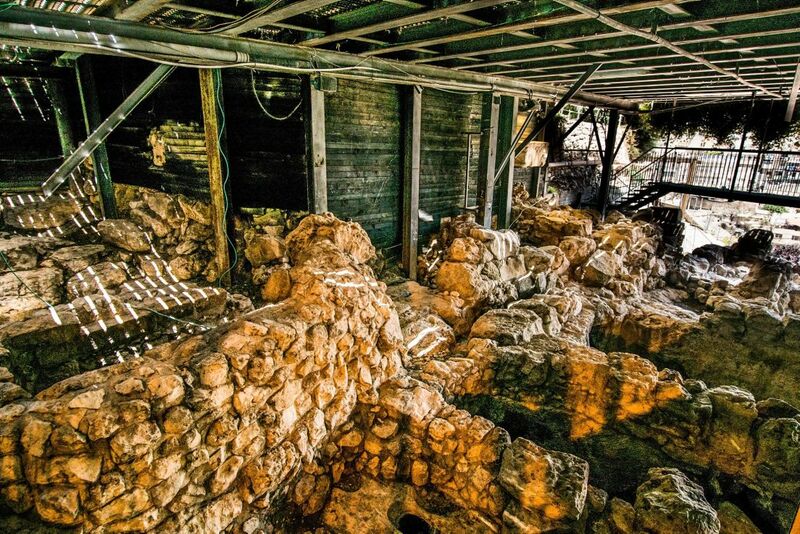 The structure Mazar uncovered lies on a hill in Jerusalem’s City of David, just south of the Temple Mount, at the entrance to the contemporary Palestinian village of Silwan. At the foot of the structure are previously discovered massive terraces towering to a height of 16.5 meters, known as the “Stepped Stone Structure”. “We have proved that the Large Stone Structure [the palace] was built together with the Stepped Stone Structure. They form a single architectural unit that can be dated to the 10th century B.C.E.,” Mazar told Haaretz. She believes the Stepped Stone Structure terraces were actually supporting walls for David’s palace, erected by Phoenician builders in the 10th century B.C.E. But her dating of the palace and stepped stone structure is controversial, since it is based on pottery shards found above and below the stratum she excavated – but not in the stratum itself. Finkelstein for one doesn’t share Mazar’s interpretation of either structure. He thinks both the Stepped Stone Structure and the “palace” show more than one phase of construction, the earliest probably dating to the 9th century B.C.E. “My dating of the structure comes from my understanding of the pottery found within,” he says. Na’aman takes Mazar’s side, on other grounds entirely. The bible mentions an area in Jerusalem known as the “Millo” (meaning “mound”, 1 Kings 9:15, 1 Kings 9:24, 11:27) atop the Stepped Stone Structure, where King David is supposed to have built his palace. Na’aman however thinks the Millo actually encompassed both the Stepped Stone Structure and the space between that and the palace. He also thinks that both the Stepped Stone Structure and that space should be dated to the United Monarchy, and that it should be attributed to the King Solomon, who – the bible says – was building within this Millo. What was he building? The Stepped Stone Structure, says Na’aman. “It fits very well with the account in 1 Kings 11:27 of the rebellion of Solomon’s taskmaster Jeroboam, who was supervising the stoneworkers from Mount Ephraim,” says Na’aman. “If you look at the Stepped Stone Structure and realize how much stones and earth you need to construct it and how many workers were required, you can understand why they rebelled,” he quips. Or maybe it was Saul, after all. Philip Davies, professor emeritus of biblical studies at Sheffield, suspects that it was actually Saul’s Israelite kingdom that built the Stepped Stone Structure. “Since a few biblical texts assign Jerusalem to Benjamin, and since Jerusalem is quite near to Saul’s reported base, I would have to deduce that any Iron IIa remains in Jerusalem [1000-925 B.C.E.] can much more probably to be assigned to him than to a hypothetical ‘David’,” says Davies. There are even more theories. Some archaeologists think the monuments might be the remains of an immense substructure of terrace walls on which the Jebusites built a fortress, for instance. 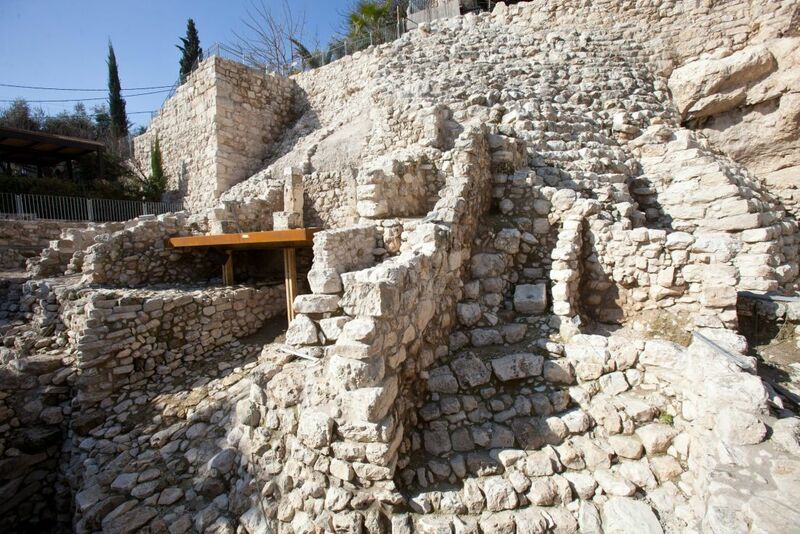 Actually, the Stepped Stone Structure is just part of a larger problem facing archaeologists excavating in Jerusalem. Lying above tombs from the 9th century B.C.E. sit Byzantine houses that are still in use. Jerusalem has been occupied continuously for millennia, severely constraining the excavation options. Also, the city was destroyed several times. New cities were built atop the ruins, often using material repurposed from those ruins. Piled-up debris, in some places 30 meters deep, obscures the early contours of the site and makes interpreting the excavated evidence a precarious task. However much the archaeologists dance on the head of a pin, each will have his own perspective on the Stepped Stone Structure. None are likely to ever find evidence beyond the contextual to support their theories. Israel Finkelstein is famously careful when dealing with biblical material. He sees the description of a great United Monarchy – a sort of a Golden Age – as the product of authors who lived around 250 years after the time of David and Solomon, who were advancing a royal ideology of their own time. Therefore, the “Golden Age” should be understood as a Golden Age to come rather than an account of the past, according to Finkelstein, who suspects that if anything, David and Solomon ruled over little more than a village located on the Temple Mount. “In order to understand Jerusalem of the 11th and 10th centuries B.C.E., one needs to take a broader look. First, I think that the original mound of Jerusalem was located on the Temple Mount. Second, Jerusalem started expanding from this original mound only in the 9th century B.C.E. This means that in the 11-10th centuries, the city was inhabited, but was still modest in size and material culture,” Finkelstein says. It is a convenient theory, but there is not one shred of evidence to support it. Meanwhile, about 32 km southwest of Jerusalem, in the vicinity of the low plain of Elah, Hebrew University professor Yosef Garfinkel unearthed what he believes was a mighty Judahic city dating to the time of David. The site is called Khirbet Qeiyafa and has archaeologists wrangling mightily over what the city had been. “Khirbet Qeiyafa indicates that urbanism started in Judah at 1000 B.C.E., the time of King David,” Garfinkel says. If David ruled over a small kingdom, with a total population of around 5,000 people in a few cities and villages as Finkelstein claims, that does not fit with mighty Qeiyafa, Garfinkel objects. Beneath later Hellenistic layers, Garfinkel found buildings, walls and two gates that date to the 11th century B.C.E. He is confident that the Khirbet Qeiyafa is the remains of the biblical town of Shaarayim. As usual, not all agree. Na’aman insists that the bible identifies Shaarayim elsewhere (1 Samuel 15:35, Joshua 15:35). He feels speculation on the affiliation of the city is premature and new evidence will be needed. Garfinkel however says that in material culture, Khirbet Qeiyafa is clearly Judahic. For example, it features private houses abutting the city wall, an arrangement unknown in Philistia but found at Judahic sites (including Be’er Sheva). The main point, in Garfinkel’s eyes, is the sheer magnitude of the Qeiyafa fortifications: there had to be a central administration that could enable such immense works, he argues. That in turn supports the theory of the United Monarchy. Moreover, no figurines of female fertility goddesses were found, though they would likely have been if the site had been Philistine, Garfinkel says. And he has another card up his sleeve: two pottery sherds featuring proto-Canaanite writing, with verbs characteristic of Hebrew. Beyond whether or not there was a kingdom, there’s a question of whether or not there was a man. In 1952, after resigning from the military, Yigal Yadin devoted himself to research and began his life work in archaeology. In 1955 he found the city gates of the biblical city of Hazor (aka Hatzor). A few years later, with Bible in one hand and spade in the other, he excavated at Megiddo (Armageddon, in Christian tradition), where he found a monumental palace. Guided by the book of 1 Kings and the stratigraphy, Yadin dated pottery inside the palace to the 10th century B.C.E., the golden era of King Solomon. It is perhaps a strange irony of fate that shortly after Yadin had made these discoveries, the reaction against the biblical school began to assert itself, resulting in the “minimalist” school of Israeli archaeology, headed by scholars from the University of Copenhagen. To them, David and Solomon were fabled characters no more historical then legendary Viking kings such as Ragnar Lodbrok. The skeptics suffered a severe setback in 1993, when archaeologists working in the northern Israel site of Tel Dan uncovered a victory stele with a word on it, bytdwd, that many, if not all, translate as “beit david” – the “House of David”. “I am inclined to deduce from the stele that Judah was ruled, though always as a regional tributary to either Israel or Aram, by the ‘house of David’,” Davies told Haaretz. But: “‘David’ is hardly a personal name, perhaps a title. It’s uncertain whether the dwd in bytdwd denotes a person,” Davies told Haaretz. He suspects the Judahite tribes came to think of a ‘David’ as the founder of ‘Judah’, but until it became a kingdom much later, in the mid-8th century B.C.E., probably, thanks to Assyrian recognition – “Judah” denoted a territory, not a political entity. Uncertainty continues to prevail because there is simply no contemporaneous extra-biblical information regarding Solomon, explains Gabriel Barkay. In fact, there are no historical sources from Egypt, Asia Minor and Mesopotamia for the years from 1200 to 900 B.C.E., which won this period the soubriquet of the “Dark Age”, says Egyptologist Dr. Mario Martin from Tel Aviv University. Take the “Solomonic” ruins at Megiddo, Hazor and Gezer. All three are named in the Bible as major provincial capitals (1 Kings 9:15). But Finkelstein for one thinks, based on radiocarbon results, that Megiddo was built in the early 9th century B.C.E., well after David or Solomon would have reigned. Hebrew University Prof. Amnon Ben-Tor, who has directed excavations at Hazor since 1990, thinks based on pottery that the monumental construction there dates to the 10th century B.C.E. “Hazor is well-planned, with fortifications, gates and well-built domestic buildings that could not have been built by semi-nomads,” Ben-Tor says. The Gezer palace, uncovered in 2016, also dates to the 10th century, based on pottery. Its fortification wall and six-chambered gate are typical of the 10th-century northern cities. “We have a radical change in city planning between the Iron Age I (1150 B.C.E.) and II (10th century B.C.E.). This is attributed to a new polity taking over and building new fortifications and administrative buildings,” Dr. Steven Ortiz, co-director of the excavations, told Haaretz. But all good things come to an end, and if there was a United Kingdom, it did too. In 2016, the Gezer excavators discovered an Egyptian jar stopper inside the 10th century stratum, with a ‘design’ typical of 22nd Dynasty pharaohs. The only 22nd Dynasty pharaoh known to have invaded Israel and Judah is the Egyptian pharaoh Shishak (aka Sheshonk I), who did so about five years after Solomon is said to have died, and was succeeded by Rehoboam. Rehoboam – unlike his fabled father – is generally accepted to be a historic figure. “Shishak’s ascension to the throne reunified the Egyptian kingdom and led to reinvolvement in the Levant,” Egyptologist Shirley Ben Dor Evian told Haaretz. The Egyptian forces also swarmed over the Aravah copper mines. Shishak’s raid of Israel and Judah is described in the bible (1 Kings 14:25, 26; 2 Chronicles 12:1-12). In contrast to Exodus, for example, there is archaeological evidence for Shishak’s invasion of Israel and Judah, and of the copper mines in the Aravah. A scarab found at Khirbet Hamra Ifdan, at the gateway to the copper district in Faynan – explored by Prof. Thomas Levy with Dr. Mohammad Najjar of the University of California – reads, “Bright is the manifestation of Re, chosen of Amun/Re” which corresponds with the throne name of Shishak. The pharaoh’s name also appears on a fragment of stele left in a dump at Megiddo by the excavators in 1925. The stele may have been erected to commemorate his victory. Regarding Jerusalem, the situation is less clear. A relief on a temple wall at Karnak describes Shishak’s campaign and lists cities in Israel and Judah that his forces captured. Jerusalem isn’t on the list. The Karnak stone is broken and that part may have gone missing. Another theory is that Shishak never destroyed Jerusalem because King Rehoboam, cringed and paid him tribute. The bible for its part describes how Shishak enters the Temple and strips it of its treasures (1 Kings 14:25), which may have induced the pharaoh to spare the city. In other words, this evidence is painfully indirect, but if the biblical description of Shishak’s conquest of Jerusalem is true, it could lend credence to the narrative of the United Kingdom. While many scholars accept Shishak’s invasion of Israel and Judah in 925 B.C.E. as a historical event, they don’t necessarily think that supports the biblical narrative prior to the Egyptian invasion – in effect, the United Monarchy. In 1870, Henrich Schliemann put his shovel in the Asiatic mound Hissarlik and found Troy. A few years later, following instructions in the Iliad, he went to the area where the city’s destroyers were said to have come from, and dug up “Golden Mycenae”, Agamemnon’s city (Homer 11.45). Today, Homeric kings such as Agamemnon, Nestor, Diomedes and Odysseus are widely accepted as historical figures. Davies qualifies that while he thinks Agamemnon might be historical, he doubts that Paris, Odysseus, Achilles and Hector were. “There is an important difference between the historicity of a name, and the historicity of the details of a narrative. I don’t know any classicist who would advocate looking for a wooden horse,” he says. The descriptions of King Solomon and David in the bible were probably embellished, to paint a picture of a vast, prosperous kingdom. But the bible’s writers typically lived centuries after the period they were writing about. Nor were they beholden to today’s principles of veracity, and, as they say, the story is written by the winners. When we read and try to interpret biblical narratives it is vital that we understand how historical narrative and cultural memory works. The bible mythologies the grandeur of David and Solomon and the memory of their kingdom have changed over time, all the individual stories have been forgotten. All cultures smooth the individual stories into one useful narrative. Apparently sometimes the Bible is right, other bits have been distorted, and often we simply cannot know. The Old Testament describes Assyrian kings and Egyptian pharaohs whose existence has been proven beyond doubt. But we may never know the truth of what really happened in the 10th century B.C.E., the time of David and Solomon. And even if no grandeur from a Davidic kingdom has survived, unlike the ruins still evident of the grand empires of Assyria and Egypt, the biblical stories of David and Solomon live on.